My son, David, is a rambunctious four and a half year old who, since he was a toddler, has excelled in communication skills and absolutely loves to read. In fact, he can currently read several hundred words. I say this not to brag (well, maybe just a little), but to give other parents of children with Down syndrome encouragement. 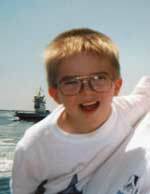 David was born on February 16, 1996, and diagnosed with Trisomy 21. From the day he was brought home from the hospital, we read to him. My husband purchased the book The Read-Aloud Handbook, by Jim Trelease, the day before David was born. The reasons given in this book for reading to your infant and the personal success stories it described spurred us on. We read an average of ten books to him per day. To keep his interest, we read books with bright, colorful illustrations and rhyming verse, and always read with enthusiasm in our voices. A favourite first book was The Little Dog Laughed and Other Nursery Rhymes, illustrated by Lucy Cousins. He seemed to enjoy reading time very much and, by 9½ months old, he was turning the pages for us. We read an average of ten books to him per day. To keep his interest, we read books with bright, colorful illustrations and rhyming verse, and always read with enthusiasm in our voices. The December 1997 issue of Down Syndrome News, the newsletter of the National Down Syndrome Congress, contained a condensed article by Dr. Libby Kumin entitled Literacy and Language. In this article, she made a case for using reading and signing to help children with Down syndrome learn language. When David was one year old, we began taking him to Dr. Kumin's speech and language clinic at Loyola College near Baltimore, Maryland. The therapists there had us begin teaching David sign language (Signed Exact English). They also mentioned that other parents had spoken of success with a reading program called Love and Learning, saying that it helped with their children's articulation. Teaching reading to children with Down syndrome: A guide for parents and teachers by Patricia Oelwein. Glenn Doman's book promotes teaching infants and toddlers to read sight words. I read this book when David was an infant, but had not found time to make the materials necessary to implement the program. I had heard positive comments about Patricia Oelwein's book. It was attractive because it addresses teaching children with Down syndrome in particular, but she states that her program is intended for children four years of age or older due to the level of interaction and discrimination skills necessary. Her program begins with teaching sight words, but the teaching methods are geared toward older children. The Love and Learning program was the perfect answer for David. It is intended for babies and for busy parents. Rather than a book for the parents to read, it provides comprehensive sets of materials needed to implement the program and some tips on its use. 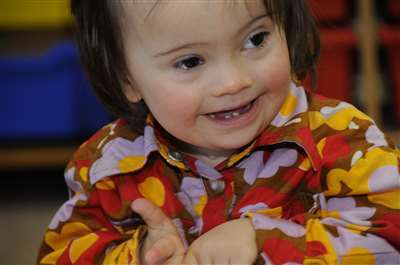 This practical program was developed by parents of a child with Down syndrome. Each of the Love and Learning kits contain a set of books, an audio tape and a video tape. The books are very simple and could be easily made at home, but the value of the program stems from the way the books and tapes work together to teach the child. Love and Learning teaches sight words, the ABCs, and then numbers and other concepts. Like the Glenn Doman method, with Love and Learning the parent teaches the child by showing him the material quickly and without testing. There are no pre-requisite skills, and the young child is less likely to tire of this method than one in which he is constantly drilled. I had read that children with Down syndrome are often visual learners. I had also read that the brain grows the fastest and is the most receptive to stimulation in the first few years of life. These facts motivated me to continue teaching David. I wanted to take advantage of his strengths and work with him as much as possible, at the optimum time, to help maximize his potential. Signing helps to bridge the gap between a child's receptive and expressive language abilities. The amount that your child understands far exceeds what he is able to communicate to you. It seems obvious that communicating is more desirable than not communicating. Signing helps to prevent the child (and parent/caregiver) from becoming frustrated. As a toddler, David was with a baby-sitter two days per week. When David had just turned two, the sitter said that she could communicate with David, whereas she couldn't with another non-disabled boy she cared for who was the same age. One morning, I left the list of words that David could sign with the sitter. When I picked David up that evening, I asked her if I needed to show her any of the signs. She laughed and said it wasn't necessary. David had shown her the signs she didn't know as she read through the list! I believe that signing also facilitates the child's cognitive development because you are able to affirm that what the child is thinking, and then expressing through signs, is correct. For example, the child signs "hear vacuum" and you can say and sign "yes, Mommy hears the vacuum" or "no, Mommy hears a truck." Studies have shown that fears of further delays in speech due to the use of signs are unfounded; in fact, signing may help to promote speech. The article How Manual Sign Acquisition Relates to the Development of Spoken Language: A Case Study, by Theresa Kouri of the School of Speech Pathology and Audiology, Kent State University, documents one of the studies which have found signing to have a positive influence on learning to speak. The January/February 1998 issue of the newsletter Disability Solutions contains a great how-to article on teaching signing. After learning his first sign, 'more', which took a couple of months of modelling, David learned new signs quickly. At 15 months, he was signing 'more' and 'book.' By 18 months, he had added 'cookie', 'eat' and 'milk'. We began using Love and Learning with David when he was 15 months old. His signing and reading really took off when he was about 21 months old. The ease with which he learned signs was demonstrated when he was taught the sign for 'paper'. A therapist showed him the sign one morning; and, with no reinforcement, he signed 'paper' days later when his dad gave him a piece of paper to play with. I was amazed at the way he could associate the spoken word with the written word and the manual gesture. the written word "kiss" is associated with the spoken word "kiss"
the spoken word "kiss" is associated with the gesture for blowing a kiss, and he had combined them on his own. I went so far as to confirm that no one else had ever shown him the word "kiss" while blowing a kiss. Another enlightening article, in the September 1997 issue of Down Syndrome News, mentioned similar findings with other children during a research study. The title of the article was Reading before talking: Learning about mental abilities from children with Down syndrome, by Sue Buckley. I had read that there is usually an explosion of vocabulary when a child is around two years old, and we were trying to take advantage of it. By that age, David was signing about 75 words and reading at least 60 words. He would demonstrate his reading skills through the use of signs and pointing. The Love and Learning program is such a convenient way to expand the child's vocabulary. A child who has mastered the kits has a receptive vocabulary of at least 500 words. If the parents sign the words as they read the books to the child, they are helping to keep the child's expressive vocabulary growing along with his receptive vocabulary. The Love and Learning reading program was surprisingly easy to use with David. He loved the videos and would request them several times a day. He enjoyed the Love and Learning books just as well as any of his other more colorful books. My husband and I believe that reading to him as an infant set the stage for his receptiveness to the program. If you make reading aloud a cuddling time with your infant, it will be a very pleasant part of everyday life for him and you will most likely have a toddler who begs to be read to. If you don't start early, you may have a toddler who won't sit still for this activity that he is unaccustomed to and, therefore, doesn't appreciate. I have spoken with mothers of toddlers with and without Down syndrome who say that their child is perhaps more active than mine and has a shorter attention span. They have trouble reading to their child. When David was put on steroids at 22 months old, for an unrelated illness, we were afraid that he wouldn't sit still for reading time because steroids tend to make a child hyperactive. We were pleasantly surprised. Although he would tire of a particular book sooner, he continued to love to be read to. There is no doubt in our minds that reading aloud to David when he was an infant facilitated the use of the reading program with him as a toddler. My only difficulty in teaching David to read and sign was keeping ahead of him, teaching him new signs and showing him new books, so that he was continually challenged. In addition to using commercial children's books and the Love and Learning books, I created several books using photographs of household objects and people in his life. Using a thick felt tip pen, I labelled each picture with the appropriate word in plain lowercase letters. I also placed labels on the actual objects in the house such as the refrigerator. The first Love and Learning book consists simply of the lowercase alphabet, one letter per page. I not only used this book to teach David the ABCs, but it was also an aid in getting him to vocalize. By two years old, he was trying to say the letters when he saw them. At that point, he was making vocal approximations for b, d, f, i, j, m, o, p, r, v, w and y in advance of my saying the letter. It may have helped that I had always exaggerated the sounds. By 27 months, he could recite the alphabet in its entirety, pronouncing all letters intelligibly except for g and h.
David has demonstrated tremendous progress in his acquisition of speech and language since he turned two years old. At two years, David began using word approximations, usually signing the word as he tried to say it. At two and a half years, he began putting two words together and he used signs less frequently. At three years, David was saying phrases/sentences of one to four words, with two and three word phrases being predominant. He could say words such as "clock", "leaf", "blower" and "hangers" clearly and with good enunciation of the consonant blends and word endings. He was intelligible to people outside of the immediate family without them first knowing the context in which he was speaking. He was also beginning to learn grammatical structures. He understood and used plural and possessive forms, he used the suffix "ing" appropriately, and he used the pronouns "I" and "me." At four and a half years old, David continues to make progress in all areas of speech and language development. He has increased the length of his spontaneously generated sentences. A recent language sample obtained from his private speech therapist revealed a mean length of utterance of 5.0 morphemes per utterance with an upper morpheme boundary of 10. This calculation places David within normal limits for children his age. I have also heard him string sentences together on many occasions. For example, he has said, "Daddy, I ate all my graham crackers. Please give me some more." Standardized diagnostic testing was administered to assess David's receptive and expressive language abilities. The testing was performed when David was four years, four months old. He was given a total language comprehension age of 3-5 to 3-8. His receptive and expressive vocabulary skills were found to be within the average range for typically developing children. David now uses pronouns (he, she, you, it), articles (the, a), plural and possessive markers (s), and asks Wh-questions (who, what, where). He initiates and responds appropriately to topics of conversation and continues to improve the intelligibility of his speech. David still enjoys exposure to the written word through books and the Love and Learning videos. Because the written word has more long-term value to David than does signing, I suggested that the written word be used during speech therapy to help increase David's length of utterance. His speech therapist at school has successfully used written sentences to cue David to add words such as "is", "the", "of" and "in" to his speech. David seems to be at a point now where he can also be taught reading through a phonological approach. I have taught him the sounds that each letter makes, and he is enrolled in the Hooked on Phonics program taught at his daycare center. His teacher there said that she pulls David out of the class to teach him individually because he is learning faster than the other four year olds. I can think of no greater joy than the feeling you get when your child begins to communicate with you. Signing, used as an initial method of expressive communication, can give the child the opportunity to achieve the cognitive growth that speech promotes before the child has the ability to speak. Reading to your child from birth has numerous and immeasurable positive effects including increasing attention span, providing opportunities for the child to hear speech, teaching the book's content, expanding the child's vocabulary and laying the groundwork for a lifelong love of reading. The written word can also be used as an effective tool in speech therapy. It is also great fun to teach your child to read, especially at such a young age. The sooner you begin with the child, the easier it is; and that early stimulation may make a difference to that growing mind. Oelwein, P., (1996) Teaching reading to children with Down syndrome - a guide for parents and teachers. Woodbine House, Bethesda, MD. Buckley, S. (1997) Reading before talking: Learning about mental abilities from children with Down syndrome.